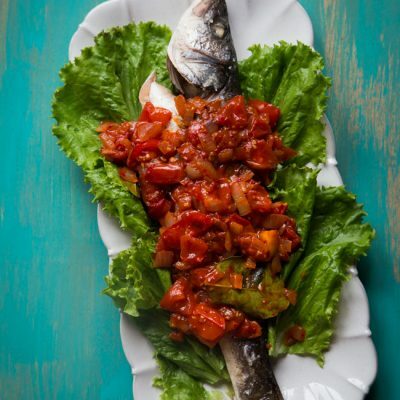 Mom’s Quick and Easy Sambal Tomat Ikan (Indonesian Fish Sambal)- Baked whole fish is smothered in delicious and spicy tomato-based sambal sauce. Make sure you cook enough rice for the sambal. My mom and I are both fish eaters. We love fish a lot. When we refer to fish in Indonesia, usually it’s a whole fish. Hardly there are any fish fillets, unless you fillet yourself. 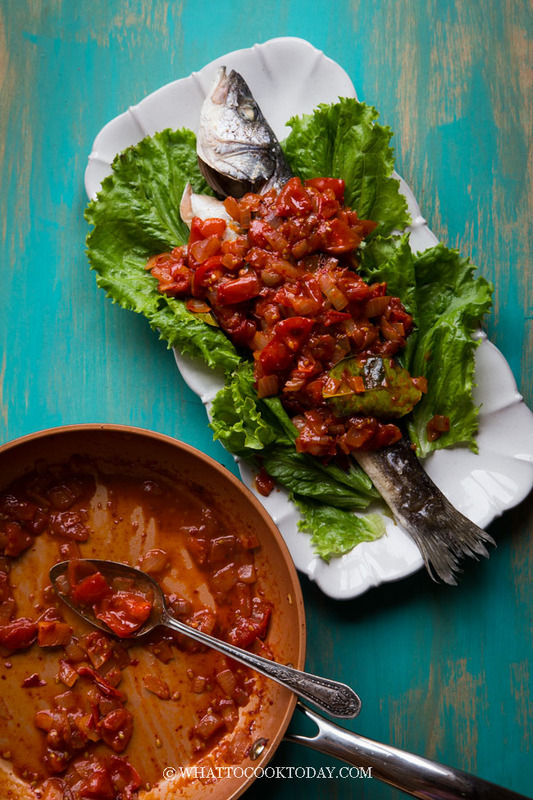 Mom will usually deep fry or steam the whole fish and then smothered the fish with this delicious sambal tomat. My mom likes to include tomato in her sambal used to make sambal ikan, which is pretty similar to the Javanese version of sambal tomat, but this is more of her version. The sambal ingredients are ground and then cooked with tomatoes. The taste is more at the sweet side than savory. Mine looks more of a “rustic” version. You can definitely grind the tomato along with the chili too for a smoother texture. 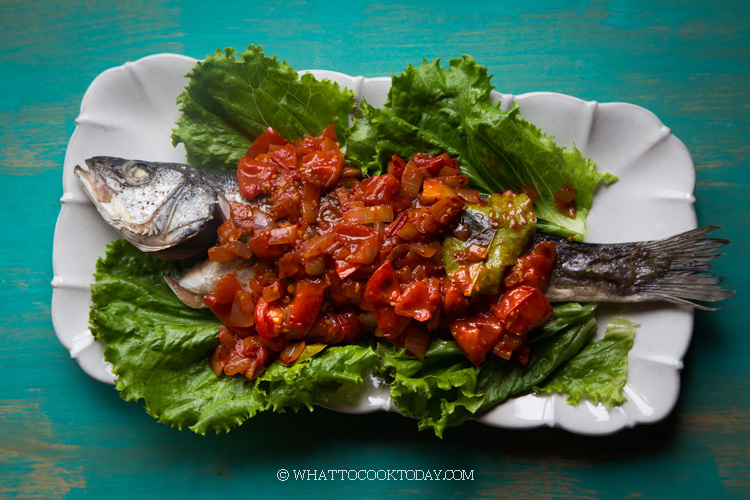 WHAT KIND OF FISH TO USE TO MAKE SAMBAL TOMAT IKAN? 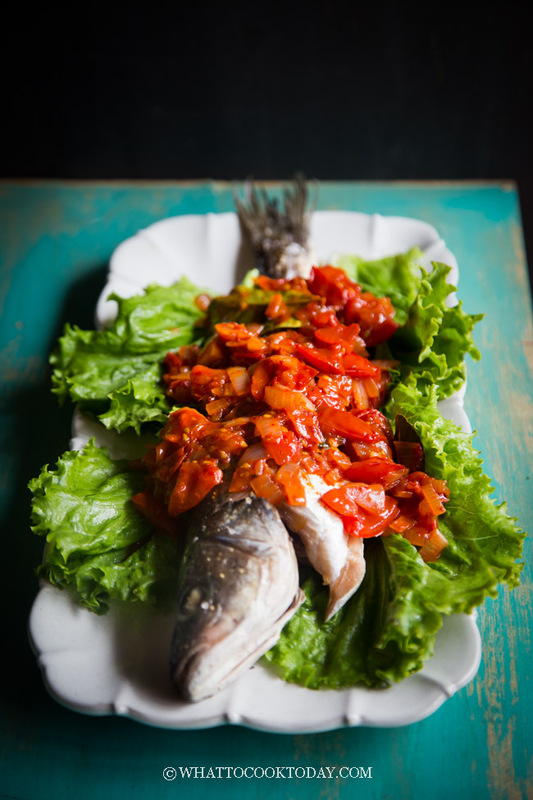 In Indonesia, people like to use small-size whole fish like Ikan Selar (Yellowtail scad), ikan tenggiri/tongkol (mackerels), ikan kembung (which is also translated into mackerel in english) to make sambal ikan. 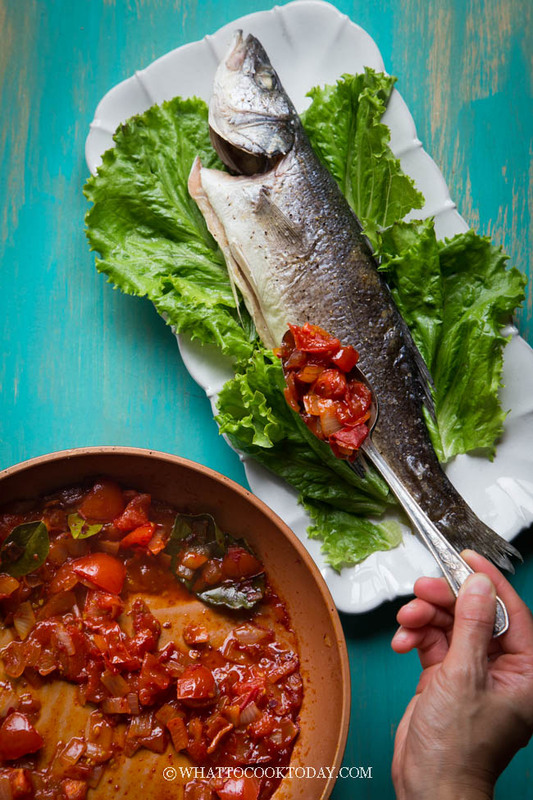 I use whole sea bass in this recipe. You can definitely also use white fish fillet such as tilapia, cat fish, swai, just to mention a few, if you don’t want to deal with whole fish. If you choose to deep fry the fish, make sure you have enough oil so that the fish can “float” as you fry it or the skin will get stuck to the bottom of the pan and get ripped. Place the fish on a plate and then steam on high heat for about 12 minutes or until cooked through. Discard the liquid after steaming and spoon the sauce over. 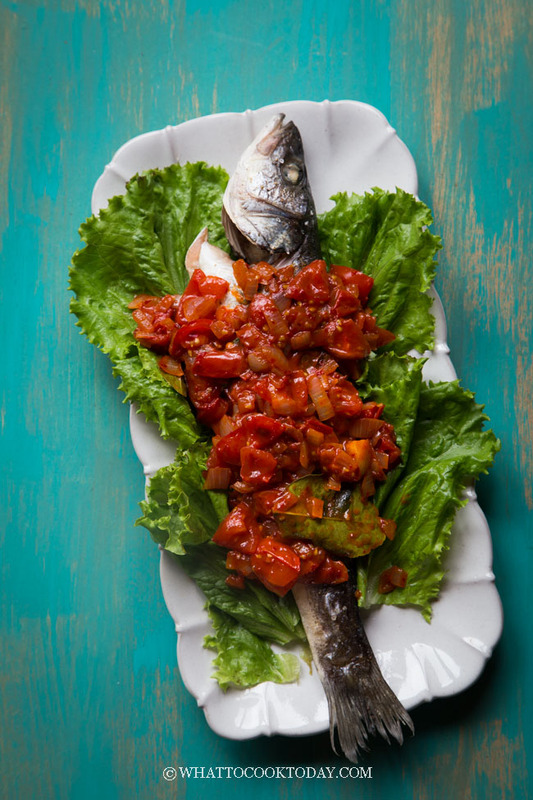 Whole fish is smothered in delicious and spicy tomato-based sambal sauce. Make sure you cook enough rice for the sambal.